Main man Michael Palm Toft delivered another masterclass as table-topping Peterborough Panthers reached the halfway point of their SGB Championship campaign in stunning style last night (June 21). The city team roared to a second away success in less than a week when thumping 48-42 at Redcar - a result which carried them seven points clear at the summit. Tom Bacon rode well for Panthers at Redcar. Palm Toft headlined another stellar Panthers showing with a 17-point haul. He only missed out on a second six-ride maximum of the season when beaten in the final race of a memorable night. Palm Toft has now piled up a terrific 44 points in his last three Panthers outings and also managed a 15+3 haul when in action for top-flight side King’s Lynn earlier this week, but it wasn’t a one-man show by any means. Reserve Tom Bacon continued his fine form while number one Scott Nicholls and Palm Toft’s middle-order partner, Bradley Wilson-Dean, also scored heavily to ensure club owner Ged Rathbone maintained a 100 per cent record against his hometown team since taking control of Panthers in 2015. And while the chasing pack do boast meetings in hand on the city racers, they are now odds-on to earn a play-off place. Team boss Carl Johnson said: “We’ve now had three away wins in total this season and picked up results at all types of tracks. We were confident we would do well on the road and 11 points from five league meetings is a brilliant return. “’Tofty’ was awesome again, Tom produced another great performance at reserve and the other boys all chipped in with the points we needed from them. “Things are going well and everyone is enjoying their speedway. That’s what it is all about for us. We’re having fun, the mood in the camp is fantastic and we’re in a very good position. “I expected us to be doing well, but probably not right up at the top of the table if I’m being completely honest. We have to remember we are only halfway through the season, though. And this was certainly another one. Panthers forged into an early advantage courtesy of a 5-1 from Palm Toft and Wilson-Dean in heat three, but that cushion was wiped out by back-to-back 4-2s from the hosts in the fifth and sixth contests. However, Panthers responded by immediately hitting the front again courtesy of a Palm Toft-inspired 4-2 in heat seven – and this time they stayed there. Bacon’s success led to another gain in heat eight before the potent middle-order combination of Palm Toft and Wilson-Dean banked their second 5-1 of the night in heat 10. And the Panthers’ lead reached double-figures when the excellent Bacon triumphed in a 4-2 in the next instalment when deployed as a reserve replacement for Ellis Perks. Number one Scott Nicholls looked set to follow in his partner until being passed by Bears guest Josh Auty on the second lap, but the home side’s tactical substitution backfired miserably with the otherwise impressive Dimitri Berge trailing in at the rear. Redcar refused to roll over and cut Panthers’ cushion from 10 points to just four in the space of two races. Berge was seen to much better effect when taking the chequered flag in a 4-2 in heat 12 before the hosts’ borrowed duo of guests Aaron Summers and Auty followed up with a 5-1. 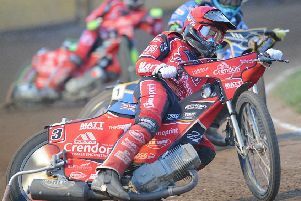 Panthers’ two trump cards – Palm Toft and Bacon - ensured they emerged victorious with a dominant display for a 5-1 in the penultimate race, but they were denied the maximum four league points in the finale. Berge claimed the prized scalp of Palm Toft while Summers held off Wilson-Dean for third place as Redcar collected a 4-2. It meant Panthers had to settle for pocketing three SGB Championship points, but it did little to detract from another fine night on the road for the pacesetters. They return to action next Friday (June 29) when entertaining Lakeside at the East of England Arena. REDCAR: Dimitri Berge 12, Aaron Summers (guest) 10, Josh Auty (guest) 7+2, Mikkel B Andersen 4+1, Nathan Greaves 4, Jonas B Andersen 3, Jordan Stewart 2. PANTHERS: Michael Palm Toft 17, Tom Bacon 9+2, Bradley Wilson-Dean 9+2, Scott Nicholls 8, Simon Lambert 3+1, Ellis Perks 2, Rider replacement for Ulrich Ostergaard.